Description of "Through Existences (eBook)"
Through Existences is a unique blend of political-social commentary wrapped into a paranormal romance. The tale tells of Marcio, a man with an exceptional gift as clairvoyance who uses it to possess the woman he desires and loves. His clairvoyance leads him into the corridor of the powers of an oil exporting country, and as he becomes close to the president of that nation, he develops a program for underdeveloped countries. Having all that he wishes for, he soon begins to perceive his downfall and dreams of his past lives as Goya the famous Spanish painter and a member of the Nazi party. Marcio doesn’t believe in reincarnation and doesn´t get the connection between his present reality and dreams or nightmares, though. These previous existences describe his relationship with his current partner. So a cycle is being closed when he finds out what true love is like with another woman –a journalist– in the present. At a posterior future, the woman for whom he has done everything to have her is a black male prisoner in an U.S. jail. And, in this way she purges all her mistakes in her past existences – being imprisoned is her karma. 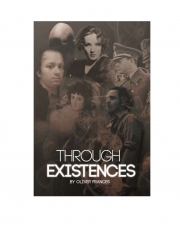 Reviews of "Through Existences (eBook)"